"Twitter knew the defamation was (and is) happening. Twitter let it happen because Twitter had (and has) a political agenda", he wrote in a 40-page complaint. He was also the centre of an investigation of the House Ethics Committee in 2017, after he released a memo claiming that the intelligence community monitored communications between members of Trump's transition team (of which he was a part). He was cleared of any wrongdoing. He is now claiming that Twitter "selectively amplified" tweets that attempted to distract him from that investigation. Tweets from the accounts have accused him of crimes such as obstructing justice and perjury. Some posts have referred to him as "Dirty Devin" and described him engaging in sexual activities with President Trump. 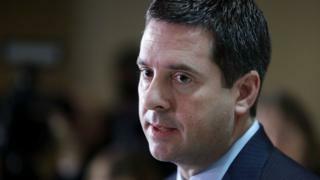 Mr Nunes has said that these allegations are false. It isn't uncommon for public figures - particularly politicians - to have to contend with parody accounts. PM Theresa May has inspired @Theresa_May_Not, @TheresaGoogling, @DowningStVogue and @emayji (a play on "emoji"). President Trump has also prompted sarcastic spin-offs mocking his policies, such as @donaltrumparody and @realDonaldTrFan. Although Mr Nunes claims that the @DevinNunesMom account "hijacked Nunes' name" and "falsely impersonated Nunes' mother", Twitter's policies do not ban parody and fan accounts - so long as the biography and account name clearly indicate that the user is not affiliated to the subject. Mr Nunes says that Twitter "shadow-banned" his account, using algorithms to make certain posts invisible to other users. Twitter's CEO Jack Dorsey has come under fire from politicians in recent years, including US president Donald Trump, for censoring conservative voices. In a hearing before US senators in 2018, Mr Dorsey admitted that the company's algorithms inadvertently reduced the visibility of 600,000 accounts - but that the company "does not use political ideology to make decisions". Although some accounts weren't appearing in search results on the platform, this was due to follower behaviour on the platform, not political affiliation. Mr Nunes does not describe how Twitter shadow-banned his account in the complaint he filed. Most of the complaint instead focuses on the three accounts that he claims posted defamatory content, and Twitter's failure to enforce its Twitter Rules and Terms of Service. "Twitter, by its actions, intended to generate and proliferate the false and defamatory statements," he said.